Mitosis is that part of the full life cycle of a cell in which a cell separates its already duplicated genome (whole hereditary information, including genes and non-coding sequences) into two identical halves. 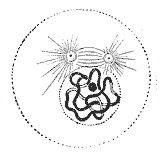 Mitosis is generally followed immediately by cytokinesis in which the two identical halves of the nuclear materials along with the cytoplasm and cell membrane are divided into two relatively identical daughter cells with the two each having a roughly equal distribution of organelles and other cellular components. Mitosis and cytokinesis often are put together as the mitotic (M) phase of the cell cycle—the division of the mother cell into two daughter cells, each the genetic equivalent of the parent cell. However, cytokinesis also is listed as its own phase (the C phase). To understand mitosis, it is divided into five discrete stages (prophase, anaphase, etc. ); however, it is actually a continuous process, rather than one of discrete steps. Mitosis occurs exclusively in eukaryotic cells. In multicellular organisms, somatic (body) cells undergo mitosis, while germ cells—cells destined to become sperm in males and ova, or eggs, in females—divide by a related process called meiosis. Prokaryotic cells, which lack a nucleus, divide by a process called binary fission. Mitosis, which yields a complete copy of the duplicated genome, is an extraordinarily complex and important biological process. New cells are continually needed by a body—the human body needs about three hundred million new cells every minute—and these new cells come only by mitosis. Errors in the prior replication of the genome or the process of separating the cell into two halves can have serious consequences for the organism and its offspring. Cancer is essentially a disease related to mitosis, involving uncontrollable cell reproduction. Because cytokinesis usually occurs in conjunction with mitosis, "mitosis" is often used interchangeably with "mitotic phase." However, in many cells mitosis and cytokinesis occur separately, forming single cells with multiple nuclei. This process occurs most notably among fungi and slime molds, but it is found in various other groups. Even in animals, cytokinesis and mitosis may occur independently, as is seen during certain stages of fruit fly embryonic development. The primary result of mitosis is the division of the parent cell's genome into two complete daughter genomes. The genome comprises a number of chromosomes, complexes of tightly-coiled DNA that contain genetic information vital for proper cell function. Before mitosis, when DNA is replicated, each chromosome makes an identical copy of itself. This process occurs during the middle of interphase, the period that precedes the mitotic phase in the cell cycle during which preparation for mitosis occurs. In animals and plants, the nuclear envelope that separates the DNA from the cytoplasm degrades and its fluid spills out into the cytoplasm. 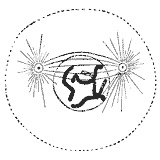 The chromosomes align themselves along an imaginary equator spanning the cell. Microtubules, essentially miniature strings, splay out from opposite ends of the cell and shorten, pulling apart the sister chromatids of each chromosome. As a matter of convention, after separation each sister chromatid is considered a chromosome, and the two copies of the original chromosome are now called sister chromosomes. As the cell elongates, corresponding sister chromosomes are pulled toward opposite ends. A new nuclear envelope forms around the separated sister chromosomes. As mitosis completes, cytokinesis is well underway. In animal cells, the cell pinches inward where the imaginary equator used to be, separating the two developing nuclei. In plant cells, the daughter cells will construct a new dividing cell wall between each other. Eventually, the mother cell will be split in half, giving rise to two daughter cells, each with an equivalent and complete copy of the original genome. Prokaryotic cells undergo a similar process called binary fission, but they cannot be properly said to undergo mitosis because they lack a nucleus and have only a single chromosome with no centromere. In a diploid eukaryotic cell, there are two versions of each chromosome, one from the mother and another from the father. The two corresponding chromosomes are called homologous chromosomes. Homologous chromosomes need not be genetically identical; they have the same genes, but may have different alleles (two or more forms of a single gene). For example, a gene for eye color at one locus (location) on the father's chromosome may code for green eyes, while the same locus on the mother's chromosome may code for brown eyes. "Sister chromosomes," "sister chromatids," "mother cells," "daughter cells," and "parent cells" have no actual gender. The use of feminine or masculine terminology is by scientific convention only. The mitotic (M) phase is a relatively short action-packed period of the cell cycle. It alternates with the much longer interphase, during which the cell prepares itself for division. Interphase is divided into three phases: G1 (first gap), S (synthesis), and G2 (second gap). During all three phases, the cell grows by producing proteins and cytoplasmic organelles. However, chromosomes are replicated only during the S phase. Thus, a cell grows (G1), continues to grow as it duplicates its chromosomes (S), grows more and prepares for mitosis (G2), and divides (M). Mitosis is a continual and dynamic process. For purposes of description, however, mitosis is conventionally broken down into five subphases: prophase, prometaphase, metaphase, anaphase, and telophase. These subphases are analogous to those in meiosis. Normally, the genetic material in the nucleus is located in a loosely bundled coil called chromatin. At the onset of prophase, chromatin condenses together into a highly ordered structure called a chromosome. Since the genetic material has already been duplicated earlier in S phase, the chromosomes have two sister chromatids, bound together at the centromere by the protein cohesin. Chromosomes are visible at high magnification through a light microscope. Just outside the nucleus are two centrosomes. Each centrosome, which was replicated earlier independent of mitosis, acts as a coordinating center for the cell's microtubules. The two centrosomes sprout microtubules (which may be thought of as cellular ropes or poles) by polymerizing free-floating tubulin protein. By repulsive interaction of these microtubules with each other, the centrosomes push themselves to opposite ends of the cell (although research has shown that there might be a mechanism inside the centromeres that also grab the microtubules and pull the chromatids apart (Tanaka 2002)). The network of microtubules is the beginning of the mitotic spindle, a group of microtubules that extends from pole to pole during mitosis and helps draw the chromosomes apart. Some centrosomes contain a pair of centrioles—barrel-shaped structures that may help organize microtubule assembly—but they are not essential to formation of the mitotic spindle. Plant cells that lack centrioles have no trouble undergoing mitosis. The nuclear envelope dissolves and microtubules invade the nuclear space. This process is called "open mitosis," and it occurs in most multicellular organisms. Some protists, such as algae, undergo a variation called closed mitosis where the microtubules are able to penetrate an intact nuclear envelope. Each chromosome forms two kinetochores at the centromere, one attached at each chromatid. A kinetochore is a complex protein structure that is analogous to a ring for the microtubule hook; it is the point where microtubules attach to the chromosome. Although the kinetochore is not fully understood, it is known that it contains a molecular motor. When a microtubule connects with the kinetochore, the motor activates, using energy from ATP to "crawl" up the tube toward the originating centrosome. The kinetochore provides the pulling force necessary to later separate the chromosome's two chromatids. As microtubules find and attach to kinetochores in prometaphase, the centromeres of the chromosomes line up at the metaphase plate, an imaginary equatorial line that spans the two centrosome poles. This even alignment is due to the counterbalance of the pulling powers generated by the opposing kinetochores, analogous to a tug of war between equally strong people. In certain types of cells, chromosomes do not line up at the metaphase plate and instead move back and forth between the poles randomly, only roughly lining up along the midline. The proteins that bind sister chromatids together are cleaved, allowing them to separate. 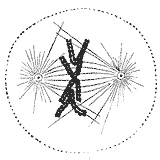 These sister chromatids, now called sister chromosomes, are pulled apart by shortening kinetochore microtubules, toward the respective centrosomes to which they are attached. These two stages are sometimes called early and late anaphase. At the end of anaphase, the cell has succeeded in separating identical copies of the genetic material into two distinct populations at opposite poles. Telophase is a reversal of prophase and prometaphase events. It "cleans up" the aftereffects of mitosis. During telophase, the nonkinetochore microtubules continue to lengthen, elongating the cell even more. 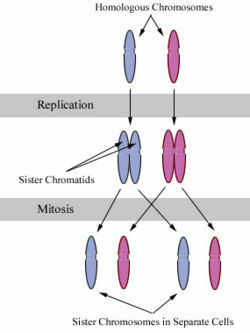 Corresponding sister chromosomes attach at opposite ends of the cell. Using fragments of the parent cell's nuclear membrane, a new nuclear envelope forms around each set of separated sister chromosomes. Both sets of chromosomes, now surrounded by new nuclei, unfold back into chromatin. Cytokinesis is often mistakenly thought to be the same process as telophase cytokinesis. If cytokinesis, the process by which the cytoplasm of a cell divides following mitosis, is slated to occur, it is usually well under way by this time. 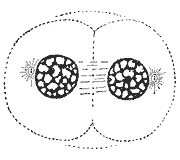 In animal cells, a cleavage furrow develops where the metaphase plate used to be, pinching off the separated nuclei. In plant cells, vesicles derived from the Golgi apparatus move along microtubules to the middle of the cell, coalescing into a cell plate that develops into a cell wall, separating the two nuclei. Each daughter cell has a complete copy of the genome of its parent cell. Mitosis is complete. Although errors in mitosis are rare, the process may go wrong, especially during early cellular divisions in the zygote (single, diploid cell resulting form fertilization of egg and sperm). Mitotic errors can be especially dangerous to the organism because future offspring from this parent cell will carry the same mutation. In nondisjunction, a chromosome may fail to separate during anaphase. Mitosis is a traumatic process. The cell goes through dramatic changes in ultrastructure, its organelles disintegrate and reform in a matter of hours, and chromosomes are jostled constantly by probing microtubules. Occasionally, chromosomes may become damaged. An arm of the chromosome may be broken and the fragment lost, causing deletion. The fragment may incorrectly reattach to another, non-homologous chromosome, causing translocation. It may reattach back to the original chromosome, but in reverse orientation, causing chromosomal inversion. Or, it may be treated erroneously as a separate chromosome, causing chromosomal duplication. The effects of these genetic abnormalities depend on the specific nature of the error and can range from no noticeable effect at all to organism death. Cancer is essentially a disease related to mitosis, involving a breakdown in the regulation process such that there is uncontrolled cell replication. Endomitosis is a variant of mitosis without nuclear or cellular division, resulting in cells with many copies of the same chromosome occupying a single nucleus. This process is also referred to as "endoreduplication" and the cells as "endoploid." Mitotic cells can be seen through the microscope by staining them with fluorescent antibodies and dyes. These light micrographs are included below. Early prophase: Nonkinetochore microtubules, shown as green strands, have established a matrix around the degrading nucleus, in blue. The green nodules are the centrosomes. 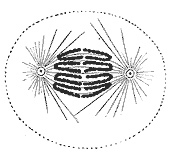 Early anaphase: The centrosomes have moved to the poles of the cell and have established the mitotic spindle. The chromosomes, in light blue, have been split by shortening kinetochore microtubules. Tanaka, T. U. 2002. 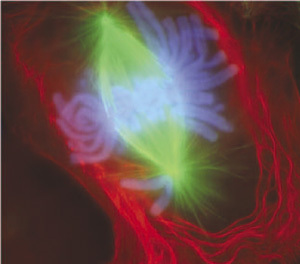 “Bi-orienting chromosomes on the mitotic spindle.” Current opinion in cell biology 14 (3): 365-71. Wells, J. 2004. “Using intelligent design theory to guide scientific research.” Progress in Complexity, Information and Design (PCID) 3 (1): 1-14. This page was last modified on 30 July 2010, at 23:17.